Can Store-Bought Carpet Cleaning Products Damage Carpet? Have you ever purchased store-bought spot removal and carpet cleaning products to remove common or difficult carpet stains? 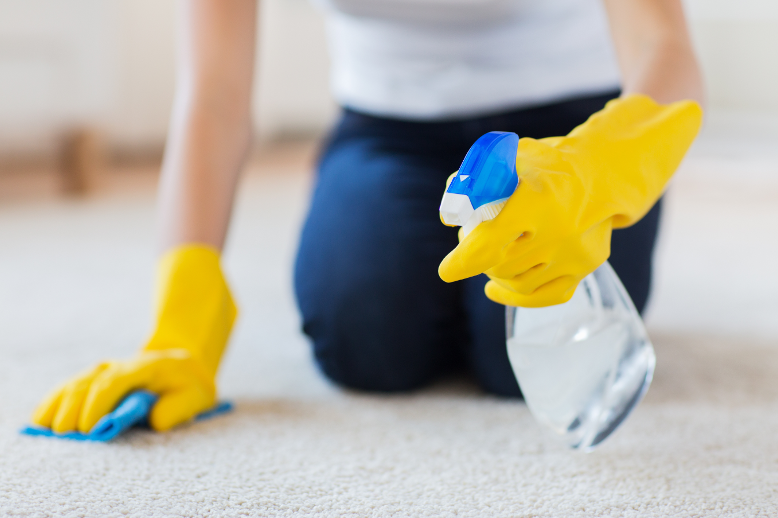 Did you know that there is just as good of a chance, if not more so, of you damaging your carpet with those store-bought cleaners as there is with the mud, wine or paint? Why do store-bought carpet cleaning products damage carpet? It’s a good question. After all, the purpose of the carpet cleaning products is to help clean them, certainly not to hurt them. The problem is that most carpet cleaning products bought at a store contain extremely harsh chemicals and components, most of which you probably can’t even pronounce let alone guess what impact they might have on the unique carpet in your home. First off, the chemicals within the carpet cleaning product could have a reaction with the fiber materials or perhaps a dye in the carpet or a pre-installed or applied carpet protector. That reaction might lead to what’s commonly known as “color loss” in which the cleaner essentially bleaches out the color from your carpet. If color loss occurs, it is almost impossible for the carpet to ever retain its color in that spot. It’s not a stain, but rather permanent damage to the carpet. In an attempt to remove the juice or soda or mud from your carpet, it is very possible that you could remove the color entirely from that portion of your carpet and create a much larger problem. Another issue that occurs with store-bought carpet cleaners is overuse. Most of the time you want to be very conservative with the amount of chemicals used when cleaning a carpet stain. If you use too much it might spread into the fibers and beyond the spot itself. Perhaps you have used a store-bought spot removal product and have had immediate success where the carpet stain appears to be gone only later to see that not only has the stain returned, but it’s actually slightly larger and darker? This occurs due to the amount of soap in the cleaning product. Soap creates a lather and sticky residue that is essentially a magnet for dirt. Think about using soap when washing dishes. You apply it heavily to your silverware and dinnerware, it attracts and pulls the dirt off of the surface of the dishes and then you rinse it off entirely using water. With carpet, you cannot rinse the soap entirely out of your carpet unless you are using professional equipment, and even then, if too much soap or water is used, it can still be difficult to remove 100% of the residue. Therefore, residue from the cleaning product will remain in the carpet and pull up the dirt embedded from the stain as well as surrounding dirt and then return to the surface darker and larger than before. If you are going to attempt to remove spots from carpet on your own, use household items such as vinegar, baking soda or just plain water. Even if these solutions are unable to remove the carpet stain, they won’t damage your carpet in the process. Now that you can see some of the dangers associated with using household cleaning products on carpet stains, you will want to consider calling a professional carpet cleaning service when your carpet needs attention. Contact us for information on our 10 Step Carpet Cleaning Process and 100% Satisfaction Guarantee.